The Namibian delegation attending the Forum on China-Africa Cooperation (FOCAC) Summit in Beijing is expected to put final touches of the deal allowing China to fund the upgrades of the Hosea Kutako International Airport outside Windhoek. Funding for the upgrade forms part of the US$60 billion in new development financing for Africa pledged by Chinese President Xi Jinping in Beijing yesterday, despite increasing criticism of China's debt-heavy projects abroad. 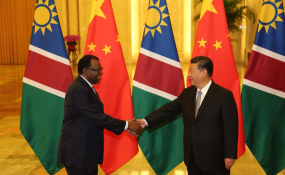 Although this aid might come with economic and commercial conditions, President Xi yesterday told Geingob and his African peers that China's investments on the continent have "no political strings attached". Hosea Kutako is the country's international airport, originally opened in 1964 under the South African administration. During an interview with New Era in March, former acting CEO of Namibia Airports Company (NAC), which manages Hosea Kutako, said the airport was originally designed to cater for 250 people only. Because of excessive congestion, security at the airport is deemed compromised. An audit in May found the airport wanting in many aspects and, as such, the airport's operating licence was only renewed for one month and was to expire on 31 August 2018. China became Africa's largest trade partner in 2009, and the scale of bilateral trade has expanded rapidly ever since. Despite criticism against China's aid, South African President Cyril Ramaphosa defended China's involvement on the continent, saying FOCAC "refutes the view that a new colonialism is taking hold in Africa as our detractors would have us believe." Rwandan President Paul Kagame, who currently chairs the African Union, also rallied behind China's involvement in Africa.